Yes, this is cheating. Yes, I'm doing it anyway. If you follow me on Twitter, you've probably been bombarded with seen my tweets about being in something of a reading and blogging slump. It's been quiet around here the last week or so, and I'm hoping to bounce back into it very, very soon. Andi's post about curating her own book tasting menu inspired me to pop by my library yesterday and check out the first five reads that grabbed me. Hopefully one of them reignites the reading and writing fire. One upside to not generating my own content is having way more time to sift through my Feedly and read everyone else's posts! (Never mind the fact that I still have an unread count of 400+... la la la.) 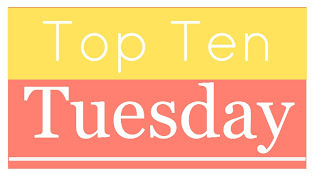 Today brought some especially good ones, with The Broke and Bookish's Top Ten Tuesday fill-in-the-blank prompt: top ten books for readers who like ________. Shannon at River City Reading shares her top ten books for fans of Wes Anderson films. Julianne at Outlandish Lit writes about ten books for people who dig experimental formats. She's weird (read: awesome) like that. Trish at Love, Laughter and a Touch of Insanity shares ten books for people who love random factoids. Me, me, me! Stefani at Caught Read Handed lists ten comic books for people who'd like to get into comics. M of Backlist Books shares ten books for people who like books about reading. Because what bookworm doesn't love those? Sarah at What Sarah Read talks ten books for "readers who like to have their feels destroyed." Um, yes. Cait at Paper Fury writes about books for readers looking to appease their inner con artists. She includes a few movies for good measure. Amanda at The Zen Leaf shares ten books for readers who like friendship in their fiction. Because, really, it doesn't always have to be about the romance. Finally, Sarah at Sarah Says Read talks her top ten books for readers who like science. As a not-so-closeted science nerd, her list was totally written for me. Did you see any super awesome lists that I missed? (I'm sure you did; there are bazillions.) Link me up! Glad to help point you toward some good'uns! Of course! Thanks for writing an awesome list of books about books. Absolutely! Loved reading everyone's lists & wanted to share. Thank you for this! I didn't get around today like I wanted. Work was just too crazy! These sound so great! I'm only just now reading the latest Feedly posts, so don't have any to add, but the ones on your list sound great! Alright...I'm totally blaming you for the explosion that's about to happen in my Feedly. Thanks to this post, I've now found at least four more blogs to follow. Darn you and your networking Shaina! ohhh what a great list, thanks for sharing this round-up! Hehe, hope you find some new books you like. I love open-ended TTT topics like this one. It's so fun to see all of these creative ideas! Thanks for rounding them up and linking to my post! Definitely a toss-up for me, too. I know I'll never get to all of them, but I love having so many choices. This is awesome! I love the idea, and especially this: "(or, y'know, complete personality)" :D Ha! I love the idea of doing a round up of TTT! I totally found some new blogs. Yay! Glad to have introduced you to some. Definitely! Thanks for a great list! My Month in Reading (and More): So Long, March!